This month, Opua Cruising Club will be hosting the Elliott 5.9 Traveller Series 2011, with two full days of racing on Saturday 24th and Sunday 25th September. You can download the Programme, Entry Form, NOR & Sailing Instructions here, or by clicking the image to the right. On Friday 23rd September the bar & bistro at Opua Cruising Club will be open from 4.00pm, and competitors are welcome to come along and enjoy a few drinks and something to eat before the competition begins on Saturday 24th. The clubhouse also has shower and toilet facilities, and a hot drinks are available throughout the day for club members and their guests. 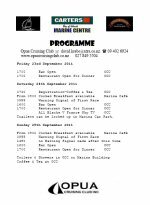 Registration will be at Opua Cruising Club in the morning, followed by a cooked breakfast at Marina Cafe, and racing commences at 10.00am. After racing, the OCC bar & bistro will be open again, and we’ll be showing the much-anticipated All Blacks v France game on the big screen. Sunday will follow a similar format, with a cooked breakfast available in the morning, followed by racing from 10.00am, and the OCC bar & bistro will be open again from 4.00pm. We look forward to seeing some very close and exciting competition from the E5.9 fleet, and wish our local competitors the very best.